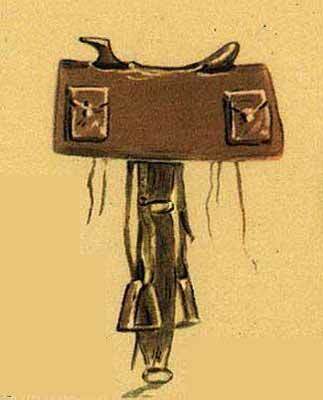 A Pony Express "mochila" was a leather saddle cover used by Pony Express riders in America during the 1800s. A mochila had four compartments (one on each side at the front, and one on each side at the rear). Three of the compartments were for carrying mail, while one was for carrying the rider's time card. The mochila had cutouts for the cantle and saddle horn so it could easily be placed over the saddle and held in place by the rider's weight. 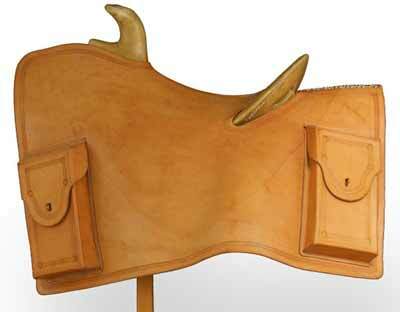 Below: A reproduction of a leather Pony Express mochila. This photo is from an exhibit at the Smithsonian National Postal Museum. It might cause some confusion for some people, but a "mochila" and a "Pony Express mochila" are two different things. The word "mochila" is Spanish for "knapsack" or "backpack." A "Pony Express mochila," on the other hand, is a leather saddle cover used by Pony Express riders. The Pony Express was a privately owned mail service that operated in America from April 3, 1860 to October, 1861. It lasted a mere 19 months before the telegraph put it out of business. It was founded and operated by the wagon freight company Russell, Majors and Waddell. 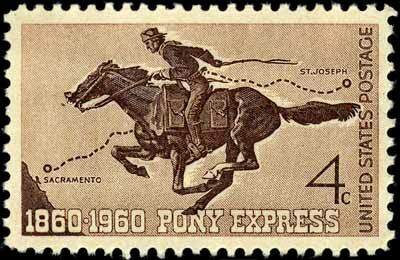 The Pony Express carried messages, mail, and newspapers back and forth between St. Joseph, Missouri and Sacramento, California. The route covered nearly 2,000 miles of American West that was often rugged, desolate, and dangerous. Even so, when conditions were right the Pony Express could deliver messages in only 10 days, a huge achievement over the weeks or months it would take by the previous methods of stagecoach or ship. Below: An 1861 painting by William Henry Jackson showing a Pony Express mochila on a saddle. The Pony Express carried mostly business correspondence, newspapers, or important messages as opposed to personal letters. That's because the price of the service was far too expensive for most personal correspondence. Ironically, even though the Pony Express was expensive to use it never turned a profit. Even so, in spite of its failure as a business venture it was a huge achievement in fast communication at the time. Roughly 19 months after its first daring and ambitious rides, the advent of the telegraph put the Pony Express out of business. It may have existed for only a short time, but it remains an endearing symbol of Americana and lore. Below: A 1960 postage stamp commemorating the 100th anniversary of the start of the Pony Express. Note the mochilla over the saddle. 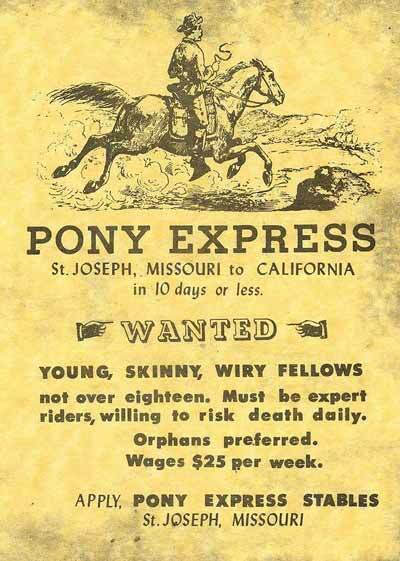 That Pony Express Ad: "Wanted: Young, skinny, wiry fellows......"
"Wanted: Young, skinny, wiry fellows, not over eighteen. Must be expert riders, willing to risk death daily. Orphans preferred. Wages $25 a week." The problem is, many (if not most historians) searching through newspapers of the time say they have never found an ad with that wording. While there were ads for Pony Express riders, none of them had that famous (and somewhat dramatic) wording. Still, it makes for a fun myth (and it was a very dangerous job, even if the actual ads were worded differently). Below: An exciting, if not historically correct, poster for the Pony Express. If you're intersted in reading more about the Pony Express, you might like the two resources below.